Due to changes in copyright law it is no longer necessary to complete a Copyright Declaration form when collecting your Inter Library Loan. Users are now able to acknowledged copyright compliance by clicking the appropriate button on the online Inter Library Loan request form. We will only be able to process a request if the copyright declaration has been accepted . If you reject the declaration, a member of staff will contact you to discuss the request further. Thomson Reuters have released the latest edition of Journal Citation Reports® (JCR), listing over 11,000 peer reviewed journals from 237 disciplines and 82 countries, with 272 journals receiving an impact factor for the first time. JCR uses citation counts to evaluate the impact of journals, aiming to present a systematic, objective review. We are pleased to report that Heather Chesters is a joint author of two book chapters on getting involved in research and on literature searching. The book is the sixth in the Unofficial Guides to Medicine series. It aims to prepare and equip junior doctors for their inevitable roles in research, audit and teaching. Qureshi, Z; Tang, C-M and Fischbacher, C. 2015. 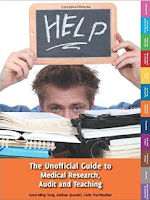 The unofficial guide to medical research, audit and teaching (Unofficial guides to medicine). London, Zeshan Qureshi. We are pleased to announce that members of staff at GOSH with a valid NHS Athens account can now access DynaMed Plus.